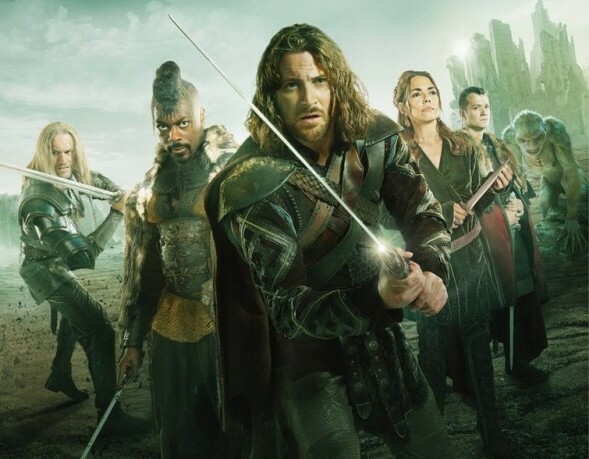 Performers include: Kieran Bew, William Hurt, Joanne Whalley, Ed Speleers, and Gísli Örn Garðarsson. This fantasy series is based on the epic, Old English poem of the same name. Set in the mythological Shieldlands, it examines notions of good, evil, heroes, villains, and law, and morality. A keen, bright warrior, Beowulf (Kieran Bew) is flawed and disenchanted. Still, he tries to live up to his stellar reputation. When he and Breca (Gísli Örn Garðarsson) reach Herot, they discover corruption and conspiracies befouling everything and everyone. Falsely accused of murder, Beowulf must find the real culprit and avenge his slain kinsman. Beowulf knows he must rise to the occasion and prove himself the hero he is rumored to be. Beowulf can count on Breca to be courageous in the clutch. Breca, though, is not above lying, cheating, bigotry, and even murder. The Thane of Herot, Hrothgar (William Hurt), adopted Beowulf with the goal of fashioning him into a leader. To Hrothgar, Beowulf is far more able than his own son. Sharp, and resilient, Rheda (Joanne Whalley) is a natural leader. Discerning and skilled in calculation, she is a formidable political foe. Theda and Hrothgar’s son is Slean (Ed Speleers). He is not a soldier of his father’s ilk. Hungry for power, Slean feels inadequate in comparison to Beowulf. Women and children brace themselves to repel a brutal attack on Herot, with Beowulf leading the defense. New loyalties and friendships are forged while others are irrevocably shattered, and some people make the ultimate sacrifice. First aired: April 16, 2016. What do you think? Do you like the Beowulf TV show? Do you think it should have been cancelled or renewed for a second season?